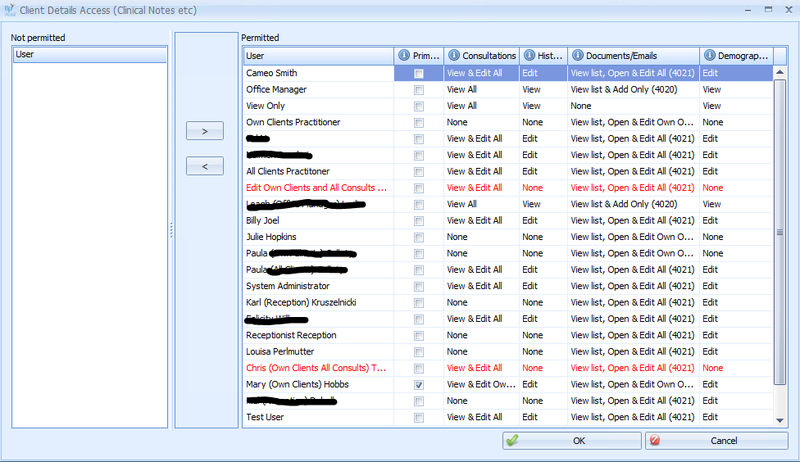 The Client Access Permissions report is a view of the Client Access table. The Client Access table defines by User their access to each Client. It also indicates if the Client permissions have been manually updated. By default this can only be run by the System Administrator. If a permission has been manually updated then the Reset Permissions option does not override this. This displays the specific permissions for this Client as they pertain to the selected User. Clicking Edit displays the permissions for that Client for all users. This can also be accessed via Client Details > Practitioner field. This allows the permissions to be manually edited. View the Client Access Manual Update report to see a concise list of which Users have manually edited client access permissions. Denotes that this practitioner is the Primary Practitioner for this client. Denotes that these lines of permissions have been manually updated via the Client Access report or the Client Details Access screen above.